My friends joke with me that I’d look forward to a zombie apocalypse. I’d almost rather deal with a few shuffling rotters than a natural disaster that actually can happen. You don’t have to be on an episode of Doomsday Prepper to need a three day supply of food and water. Just think back to Hurricane Katrina or Superstorm Sandy. I honestly don’t think I could live in the tornado alley of the Midwest or along the flood zone of the Mississippi. But then there’s no place that’s truly ‘safe’. So the best you can do is have a bit of common sense and planning. It doesn’t take much time or money but it can give you loads of peace of mind. You don’t have to worry about outrageous scenarios, just be practical about the possibility of a bad winter storm or the possibility of loosing your electricity and plumbing due to construction. But, on the million and one chance zombies do come…. Having a bit of a plan and some extra supplies can’t hurt. That way you can sit back and relax while you’re waiting until Daryl shows up. 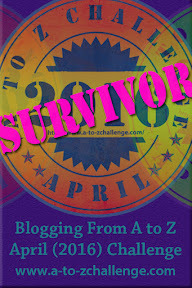 This entry was posted in Blog and tagged #atozchallenge, emergency preparedness, Just In Case, Prepper, prepping, Rachel Wilder, zombie apocalypse. Bookmark the permalink. ← Is It Inspiration, Invention or Insight? or, Where Do You Get Your Story Ideas? Oh, the Walking Dead versus Sean of the Dead meme is awesome! I’ll have to share with my partner. You are so wise, Rachel. we actually have a cellar wall lined with boxed long life foods as well as a portable water purifier called a katadyn. 🙂 Be safe and stay prepared, my dear!